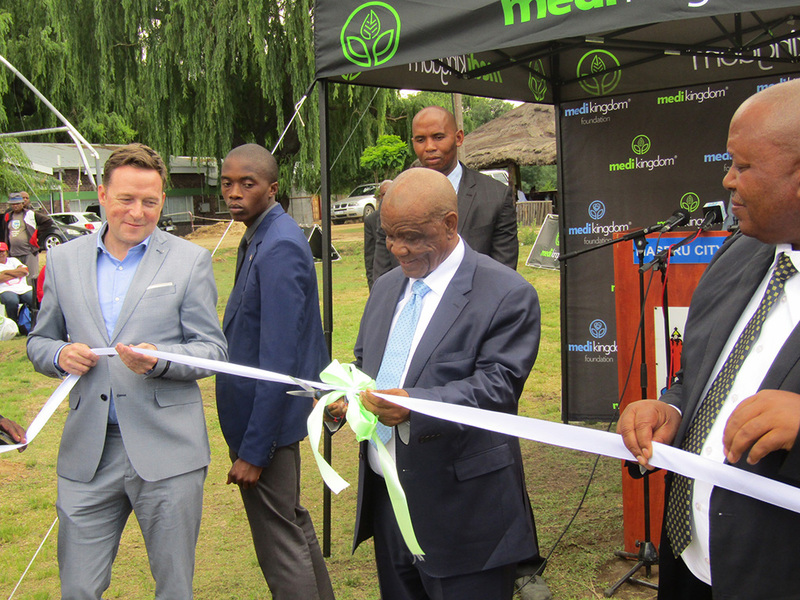 The Prime Minister, Dr Motsoahae Thomas Thabane officiated the launch of the first company to be licensed to cultivate medical grade cannabis in Lesotho at the event held on Monday at Mejametalana in Maseru. The company named the Medi Kingdom from Australia is in partnership with Basotho owned company Agri-Go for plantation of medical grade cannabis on a land of about 42 hectares. Speaking at the event, Dr Thabane said the Genesis creation narrative tells that God in His divine wisdom put man in the garden of Eden to care and nurture the land including the plants and trees for the benefit of Adam and Eve, saying sadly sin found its way into man’s heart and today, people misuse the plants which God has given them for their benefit. He added that marijuana or cannabis as some call it is one of the plants with significant benefits but has been misused by humanity for a long time. He said the government has decided to use the natural resources it has been endowed with Almighty God for the benefit of the country and indeed for the benefit of all human beings, saying the event writes a new chapter in the history of Basotho nation in which they will produce marijuana for medical purposes. He said for a long time, individuals in Lesotho have been illegally producing marijuana that ends up in illegal markets and indeed used for wrong purposes without any significant benefit to the country or its citizens, commenting that it is a well-known fact that Lesotho is one of the countries that produce high quality marijuana due to its topography and quality of soil. He congratulated the Medi Kingdom for being one of the first companies in Lesotho to be granted licenses to produce marijuana for medical purposes, noting that in line with the government policy, the company has partnered with Basotho and as such encouraged all to view it as their own hence support and protect it. He noted that the launch comes at a critical time in Lesotho’s history as the health system is overwhelmed by non-communicable diseases such as cancer, hypertension, diabetes, injuries and senile dementia which he said claim lives of countless Basotho on a yearly basis and in most cases lead to premature deaths. ‘Due to the benefits of medical marijuana, we are confident that our health system will be in a position to mount a meaningful fight against cancer, autism, epilepsy, heart diseases and many others,’ he added. The Prime Minister, therefore, urged Basotho to take advantage of the opportunity presented by medical marijuana and establish similar plantations after following due legal process, stressing that the government shall ensure a fair playing field for all Basotho. Also speaking was the Minister of Health, Mr. Nkaku Kabi who said this cannabis is not the one that they have in the country, saying that the project is very big as it is going to help cure a number of diseases. He said it is going to give the sustainable cure to diseases while at the same contribute to the economic growth as well as job creation. He thanked the Member of Parliament for Qoaling through his business Agri-Go as well as the Medi Kingdom, saying that this is going to help produce tablets and medication for different diseases for the Qoaling community and Basotho at large. He appealed to all to support the project so that it becomes a success. On the other hand, Medi Kingdom Chief Executive Officer, Mr. James Matter thanked the government of Lesotho for giving them an opportunity to operate in the country, saying this is going to impact positively in the lives of Basotho. He noted that this makes history as Lesotho will be the first country to produce cannabis in Africa. He said they intend and believe that Lesotho stands to be recognised internationally as a world class cultivator of compliant medical grade cannabis product in various forms exporting to international sophisticated markets globally. The Member of Parliament for Qoaling and also Minister of Small Business, Cooperatives and Marketing, Mr. Chalane Phori thanked the government for approving the project, saying it is going to change the lives of many Basotho. He urged the community to protect the area and should not vandalise the property, warning them that it is going to be fenced electrically. He expressed gratitude to the Medi Kingdom for extending a hand, saying this is going to be an eye-opener to many Basotho that when used correctly marijuana can bring life and cure diseases. It is envisaged that having pioneered the first legal cannabis cultivator license in the Kingdom of Lesotho, Medi Kingdom will begin its commercial exports of medical grade cannabis to the worlds burgeoning legal markets such as Australia, Canada and Europe in 2019. The project is expected to run for 20 years with the cash injection of about M550 million.